School is out; summer is here. Looking forward to July 4 brings to mind the birth of our nation, the possibilities of democracy, the promise of summer and the start of vacation. Meryl Baer reminds us that traveling is an exhilarating but also exhausting experience. No matter how wonderful our vacation may be, we are also glad to get home . . . for a vacation from our vacation. However, homecoming from Israel was put on hold for Baer, as she and her hub detoured to spend a week grandsitting three of their adorable, extremely energetic granddaughters. Now, as she tells us in her post Transitions, she eagerly awaits some long-awaited downtime, following travel, grandparenting . . . and an introduction to purple hair. Nowhere to go, just now. Just here. Nothing to do. Just be. Holding nowhere, we are everywhere at once. But for Carol Cassara the world of possibilities began when she started her own business. She reports, now that she's in her 60s, she has never worked harder in her life -- or had to be more creative. If you're interested, check out If Lipstick Always Lifts the Spirits to see her promotion of a free lipstick with purchase from her site. Meanwhile, if you are planning to go away for the Fourth, make sure your pet has a safe, anxiety-free weekend. 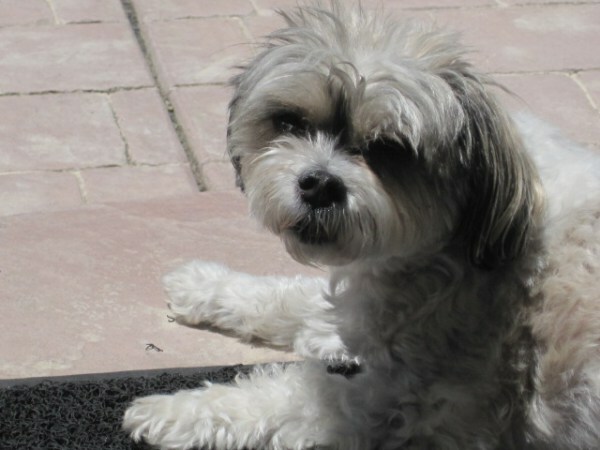 In Riley Recommends: Your Pet and July 4 Cassara's dog Riley gives you some great ways to keep your cat or dog safe and calm when the thunderstorms or the fireworks start booming. On the Survive and Thrive Boomer Guide, Rita R. Robison writes about the need for access to the outdoors for residents in assisted-living facilities. She also calls out the hazards that detergent pods pose for older adults with dementia. (Who knew?) In her post on Senior Housing she offers a link to a checklist for those who are selecting a facility for themselves or a family member. Finally, Kathy Gottberg of SmartLiving 365 tells us that The Only Thing We Know for Sure Is That We Don't Know Anything for Sure. This is a curious title for a self-avowed optimist, isn't it? But she goes on to explain that positive thought is different from positive thinking, precisely because just thinking about things doesn't change them . . . but when you change your thought patterns it often does spur the actions that lead to real change. She cites the work of Harvard professor Ellen J. Langer who has done research on the "psychology of possibility" which starts from the position that we do not know what we can do or become . . . and thus offers us all kinds of possibilities. If you're not sure what this all means, check out the post and see how Langer's approach encourages us to try new things we may never have considered before. Perhaps like . . . purple hair? I remember the first real move I made, not counting moving around in college. My new wife and I had been living in a one-bedroom apartment in a high-rise in the city, and we were moving to the suburbs, renting the first floor of a house located right across from a fire station. I rented a U-Haul trailer that attached to the back of my car. My wife and I and a friend of ours did all the packing, the loading, the moving, the unloading. One problem: I got a traffic ticket because I unknowingly drove the U-Haul on a parkway that didn't allow any trailers or commercial vehicles. But it was still a lot cheaper than hiring a moving company. And a lot more work. These days I wouldn't dream of trying to do it myself. We have far more stuff, for one thing, despite all our downsizing. And I am older, not as strong, and more prone to injury than I was 40 years ago. Anyway, we are all packed up now -- or almost -- and the movers are scheduled to show up tomorrow morning. They will arrive at our new place on Friday, and then we start the next phase of the process: unpacking and figuring out where everything goes. B drew out a plan of our new place and arranged our furniture on paper. But we have a lot of stuff in storage, and we neglected to measure all that furniture. Plus, we've lost track of what is in our mountain of boxes -- yes, we labeled them, but we keep asking, "Beach pictures? What beach pictures? And what's in that box marked Garage?" And we still cannot believe we have so many boxes! We bought boxes at U-Haul. We got others at Home Depot. Our movers gave us some boxes. You just don't realize how much stuff you have until you try to put it all in boxes. So we're doing a lot of guessing, and probably quite a bit of rearranging at some point after we move. By the way, if you ever take any advice, take this one piece of advice from me. If you're moving at our age, don't try to do it yourself. 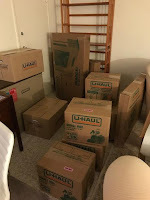 The packing itself is enough to produce back pain (we both lie on the floor every night now, doing some back stretching), strain the ankles and knees, raise a few bruises on the arms and shins, and amp up stress levels to megawatt proportions. But we can see the finish line. We are exhausted, but also excited. Please, wish us well. Oh, and one more thing. If you want to sleep at night, never move into an apartment located right across the street from a fire station. 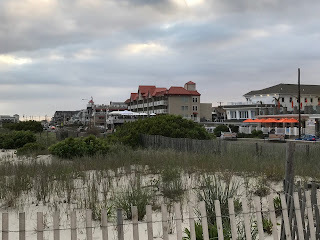 I'm in Cape May, NJ, for the long weekend. 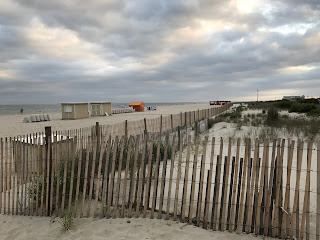 For those of you who do not come from the Northeast, Cape May is also known as Exit 0 -- at the beginning, or Exit 0, of the Garden State Parkway -- as opposed to The End, which refers to Montauk, NY, which is out at the tip of Long Island. 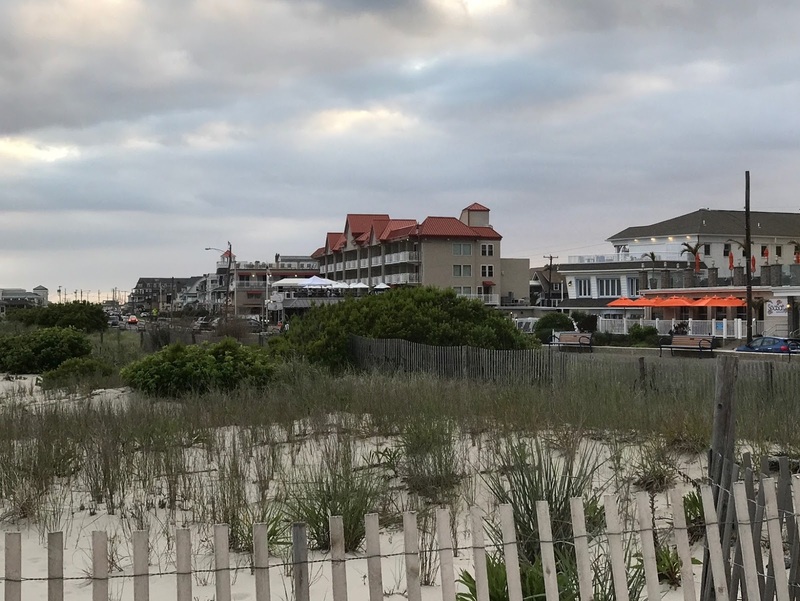 Montauk sits across from New London, CT, while Cape May is located at the point where Delaware Bay meets the Atlantic ocean. It's actually at just about the same latitude as Washington, DC, which means it enjoys a more mild climate than anything in New York or New England. Cape May is named after the Dutch captain Cornelius Jacobsen Mey, who explored the Jersey shore and the Delaware River in the early 1600s and claimed the area for the province of New Netherland. The place became a prime vacation spot for Philadelphia high society in the mid-to-late 1800s, and despite some ups and downs over the years is now known for its many well-kept Victorian buildings -- reportedly the second largest collection of Victorian homes in the country after San Francisco. Today, Cape May has become a prime destination for weddings. And so, sure enough, I am here for a family wedding, which takes place on the beach, before we retire inside for a reception at one of the seaside Victorian-style inns. 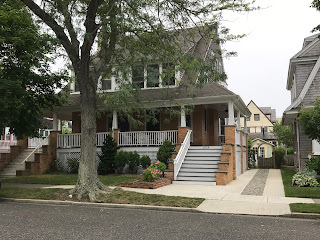 There are a lot of retired people who live in Cape May, including the woman in the other side of the two-family house we are renting. But this house we are in is not like any two-family house I've ever known. It has four bedrooms, three baths, nine-foot ceilings, a spacious front porch. It is also completely renovated, sits two blocks back from the Atlantic ocean, and is worth close to $1 million! B and I actually came to Cape May a couple of times in the past few years, when we were shopping for a place to retire. But we ultimately decided against, because the town seems pretty lonely and deserted from October through May. It's also in New Jersey, which means it's an expensive place to live. The real-estate prices are high (as you can see), and so are the taxes on retirement income. We couldn't really afford to live here -- not in the style we'd like to become accustomed to in retirement -- but we can afford to rent here for a long weekend. So I guess for us, Cape May comes under the heading of ... nice place to visit, but we wouldn't want to live here. Is Early Retirement Still Possible? As I've said many times, I am a Baby Boomer who was able to take early retirement. It's just that, for me, it wasn't entirely voluntary. But after what my boss said to me, I found that I could no longer in good conscience work for that company anymore. What did he say? "Tom, you're getting laid off. You have two weeks notice." Some people think two weeks notice is actually pretty good. I remember my ex-wife, early in her career, was once informed of her layoff after lunch on a Friday. She was told to clear out her desk and be out of the building by the end of the day. 1) I was old enough (54) so my two kids were halfway out of the house. Therefore, my financial obligations were going down significantly. 2) I had a small but still-helpful company pension, and I had contributed consistently over the years first to an IRA and then to my 401K plan, so I ended up with pretty healthy balances. 3) I could never find a fulltime job in my industry (printing and publishing) at my age -- not one I was willing to take anyway -- but I was able to cobble together some freelance work to supplement my income. I continue to take occasional assignments to this day, more than a decade later, to help finance my retirement. All this is by way of introduction to some good advice offered by my friend Jeremy Kisner, of Surevest Wealth Management in Phoenix, AZ, who has penned a helpful piece on early retirement, presented here with his permission (with a few slight modifications for space and style). And by the way, if you think you're beyond the topic of early retirement ... wait for the last line! Some people never want to retire. In fact, some research shows that the happiest seniors are those who continue to work, at least part-time, as long as they can. Nevertheless, others cannot wait to retire and are focused on achieving financial independence as soon as possible. Few things give you a greater sense of freedom than knowing you do not need to work anymore, even if you choose to. This type of financial freedom is possible prior to full Social Security retirement age for young families willing to make some sacrifices. The simple truth is the higher your savings rate, the sooner you can retire. Pretty simple, eh? You must spend less and/or earn more if you want to move up your retirement date. We usually have more control over spending than income, so spending less is the more practical strategy for most people. The biggest categories (by far) to make a real dent in spending are housing and transportation. Those two categories represent around 63% of the typical household budget, whereas entertainment is only 5.5%, clothing 3.5%, and food 13%. So if you want to retire early, you most likely will need to live in a modest home and drive used cars until the wheels fall off. The good news is smaller houses and older cars are unlikely to reduce your happiness level significantly. A growing body of research shows that we get the greatest happiness (per dollars spent) by spending our money on experiences, not material things. Conventional wisdom says you need to save 10-15% of your income to retire by age 65 at a similar lifestyle to what you enjoyed while working, assuming you will not have a big pension or significant inheritance. You will likely need a 25 to 30% savings rate throughout your career in order to retire in your early to mid-50s. The average American has not demonstrated a willingness to save nearly this much. 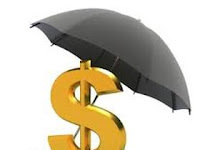 The average savings rate in the U. S. is only around 5% which includes contributions to retirement plans such as 401Ks. Here is an idea: If your savings rate is too low and the idea of budget cuts is too painful, simply commit to saving 50% of all future raises and bonuses. This strategy can produce significant savings and also keep a lid on lifestyle creep, in which your expenses grow proportionally with your income. Another pitfall of lifestyle creep: It just increases the amount you will need to maintain that lifestyle in retirement. 1. Start investing as young as possible. Savings is a habit that should start with a person's first paycheck. The math tells the story: You can save just over $998,000 by age 60 if you invest $5,000 a year starting at age 20 and average 7% investment returns. However, if you wait until age 30 to start a similar saving regimen, your nest egg would only be $472,000 at age 60. 2. Invest aggressively, assuming a time horizon of 10 years or more. The chances of retiring early are very slim if you keep your money in the bank or in very conservative investments. That most likely means investing in stocks, which have averaged about a 10% return per year over the past 90 years. Most investment analysts expect more modest returns in the future so dial back those expectations a bit (e.g. 7%). 3. If you are planning on Relocating in Retirement take a look at a state with lower state income and real-estate taxes and a lower cost of living. Consider these 23 Cheap Places Where You Will Want to Retire, or other places with similar characteristics. 4. When you consider the cost benefits of downsizing make sure you are not simply trading home-maintenance costs for steep association fees. 5. Avoid debt. Try not to ever borrow money for anything that is going to depreciate (e.g. a car, a boat, a home-entertainment center). Plan to have your home mortgage paid off by your planned retirement date. Here is a cool (yet simplistic) When Can I Retire Calculator. This calculator assumes 5% investment returns after inflation and a 4% withdrawal rate once you retire. P.S. If you are already retired, pass this on to your kids. Right now I am sitting in an empty house, all alone in our new community, with only our dog for company. I have nothing to do but clean out the basement, change burned-out lightbulbs, fix broken hardware, and go out to our new yard to pull weeds or clip back some long-neglected trees and bushes. I remember my sister telling me, after she moved from Portland to Phoenix a little over ten years ago: "I am never moving again!" Now I know what she's talking about. Am I looking for sympathy? No. Am I having regrets? No. We planned this move, and have been preparing for it for ... literally, years. Last summer we sold our family home. We moved into a one-bedroom condo and spent the past year looking for a new place to live. And now we have found it: a little house with a small yard, with a sidewalk out front and a ten-minute stroll down a tree-lined street into a cute town in Bucks County, Pa. Our taxes are lower; the utility bills are lower; even the restaurants seem less expensive. I am simply reminding anyone (and myself) who is considering a downsize that there will be times when the going gets a little difficult. It's a lot of work to sell your old house and buy a new one. 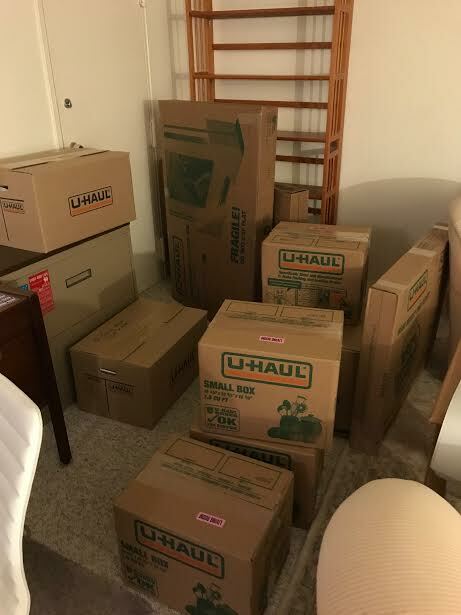 It's even more work to pack up dozens of boxes of dishes and clothes and books and pictures and the millions of other things you never even knew you had sitting in some remote corner of your house. There will be times when you will likely be uncomfortable. You might have to live in a motel for a period of time between moves. You might have to put up with the dust and dirt of any renovations you're making. I, personally, have been living with the smell of fresh paint for the past week. Yes, the walls look nice now; but I am getting real sick of living with paint fumes that linger despite every window in the house hanging wide open. You might also have to spend some time in your new house (as I am) with virtually no furniture. I have a bed. I have a small desk with a desk chair, and I brought my laptop with me. Other than that, my new house is empty. The place echoes with no carpets on the floor. Even though the weather has been nice, the house seems cold with no furniture in it. And that desk chair kept getting harder and harder, each day, until last night I saw some canvas deck chairs "on sale" outside of the Acme supermarket. So now I have a new blue deck chair that's marginally more comfortable than the torture chair I've been sitting in. Right now B is back at our old place. She has all the furniture, which sounds like she has it pretty good. But I talked to her last night. 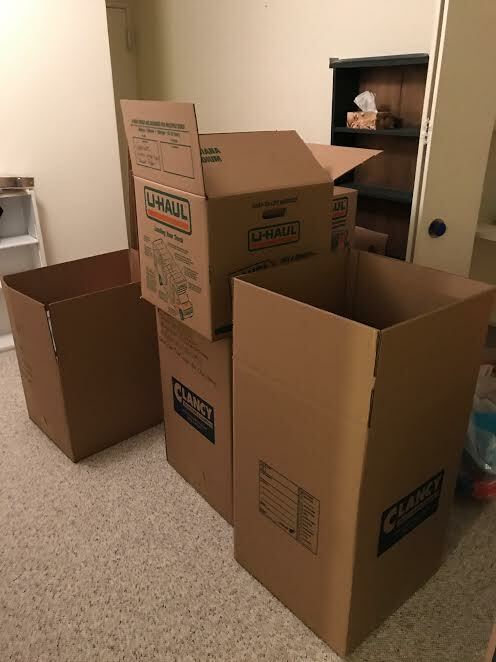 She'd spent the day packing boxes -- she counted them up for me, over the phone, and added up a dozen boxes she'd piled up against our old living room wall. Our guest room. Doesn't it look inviting?!? As far as I know, my sister is still sticking to her resolution to never move again. We'll see what happens with our move, when everything settles out. But whatever happens, I'm beginning to think that both B and I will be crying: "I am never moving again!" I am spending the weekend in Washington, DC. This morning I took the Metro from my hotel down to the Mall. Did you know that they charge an extra $2 to purchase a card for the Metro? It doesn't matter whether you use it and reuse it and recharge it forever, or if you just use it for one day. I guess it's a way to soak the tourists. I came out of the Metro at the Ronald Reagan Building and International Trade Center. It made me wonder: what would Reagan think of Trump's trade policy? I am here to pick up our dog from my daughter, who has been dogsitting for us since last summer when B and I moved into a condo complex that prohibits pets. But now we have a house again, so we can take back our dog. I am meeting my daughter, up from North Carolina, on Sunday. I came early, so I could play tourist for the day -- and also reminisce a bit, since I spent a semester here when I was in college, and then visited several times a year when my sister lived in DC in the 1980s and '90s. Back when I was younger (and more idealistic?) I did a fair amount of volunteer work in politics. I was a Democrat (still am, tho' not as enthusiastic as I once was) and worked for McGovern and Carter, as well as several local candidates. I canvassed for our city mayor (he won) and for a candidate for the New York State Senate (he lost) and was even appointed to a town commission for my efforts. But that was then, and this is now. I wouldn't dream of working for a political party these days -- not because I don't think politics are important, they are, but because things have gotten so ugly and fractious. It seems politics have become a religion. You must believe in party dogma, which allows for no dissent unless it's from the most fundamentalist faction. You hate anyone who doesn't believe what you believe; you call them names, dehumanize them and ridicule their views. It seems that, as Yeats wrote in The Second Coming, "Things fall apart; the center cannot hold ... while the best lack all conviction, and the worst are full of passionate intensity." But as you walk along the National Mall and visit the museums and see the people from all corners of the country, the political venom seems to fall away. Everybody stands in reverent memory over the events recollected in the Newseum, from the Berlin airlift to the fall of the Berlin Wall. Everybody can identify with the historical exhibits in the National Museum of American History. I learned that before Benedict Arnold turned traitor, he was a hero who along with Ethan Allen captured and defended Fort Ticonderoga, thwarting Britain's attempt to invade from Canada. And, it seems, everyone is interested in the newest building on the Mall -- the National Museum of African American History and Culture. I tried to get a ticket to the museum ahead of time online; but it was sold out. When I went down there, I saw a huge line trailing down the street for the few tickets available at the door. So I the went to the history museum and saw the exhibits on money, transportation, military history, Japanese internment. I walked the Mall; saw the Capitol building, the Washington Monument, the White House. I wanted to see the Vietnam memorial, which I visit pretty much every time I come to Washington, but my knee gave out and so I just walked back up to Farragut Square (named after Civil War Admiral David Farragut, famous for the Battle of Mobile Bay) where I caught the Metro back to my hotel. Farragut Square at K and 17th St.
By the way, is anyone visiting Washington, DC, anytime soon? I have a Metro card for sale . . . just $2, which includes the cost of the card, plus a 65-cent credit for the amount I did not use this weekend.